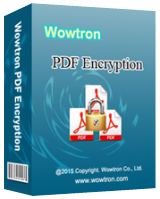 WowTron PDF Encryption is a simple Windows PDF encryption software designed to help you encrypt Adobe PDF documents in batch. It provides users with a secure way to add password to PDF files to prevent unauthorized users from reading or opening. You can also set owner passwords for PDF file, preventing your PDF files from printing, editing, coping, and changing. It does not requires Adobe Acrobat, or any other Adobe software. Two types of password for PDF file: Owner passwords and User passwords. Owner password can be used to protect PDF files from printing, editing, change, and copying. With an owner password, users can get full access to the PDF file. User password is only used to open the PDF file. Important! You must run program as Administrator while installing.